Hardware requirements are highly dependent on the number of active users simultaneously working on documents inside the single SMASHDOCs installation. Under the active user we understand the user who is typing text in the Editor, using copy-paste, moving sections around, writing comments and so on. Docker engine is required to complete this installation. We deliver our services as docker containers, so this is a prerequisite for running SMASHDOCs. If you do not already have docker installed, obtain docker engine on your operating system of choice. Docker compose is a required tool to compose and orchestrate the SMASHDOCs environment. If you do not already have docker compose installed, obtain docker compose on your operating system of choice. To ensure an easy setup of a SMASHDOCs installation, we are providing a docker compose file. This docker compose file will spawn all docker containers which are needed for one SMASHDOCs Instance. SMASHDOCs can only be served via SSL. Therefore you must ensure that your SSL certificates are placed in the the /opt/smashdocs/certs/ folder and are named wildcard.crt and wildcard.key. 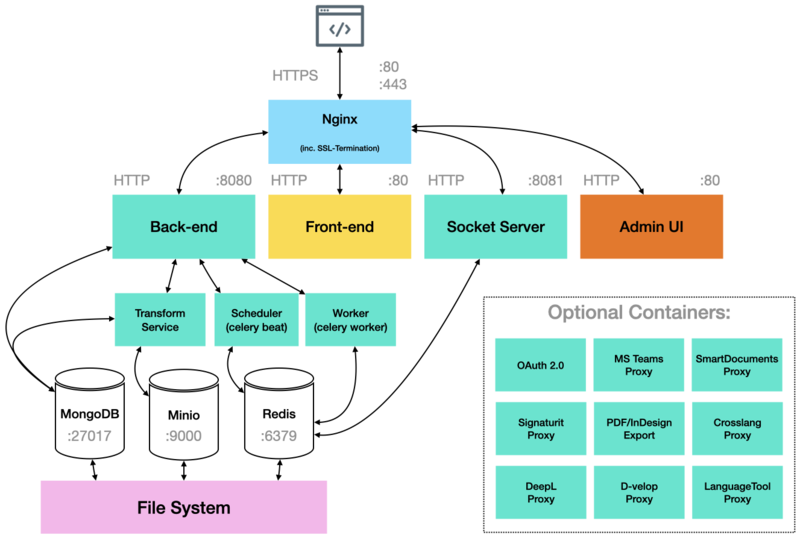 SMASHDOCs is using Nginx to route and to server all the traffic to an installation. 1: Nginx: The “NGINX-Proxy” docker container accepts incoming TCP (Port 4434) and HTTP (Ports 80, 443) traffic and is responsible for the SSL termination. SMASHDOCs ships the NGINX-Proxy with a default nginx.config for easy installation and usage. Some of the properties in the nginx default config will be overwritten with defined the environment variables by the docker entryfile. The docker-compose.customer.yml file is an example docker compose file which sets up a SMASHDOCs Installation which could be available via https://customer.smashdocs.net. If you setup you own SMASHDOCs instance, make sure you change the configuration accordingly to your desired name and URL. SMASHDOCs can be used with an existing MongoDB Database Server. In this case the dependencies in the example docker compose file above need to be removed. Copy the Docker compose example setup file from above and place it to your hosts file system as /opt/docker-compose/docker-compose.smashdocs.yml . These should be changed to reflect your environments needs. SMASHDOCs has a Provisioning API (provisioning.html) which can be used to configure a SMASHDOCs installation. The provisioning key is a random key a partner can choose by himself and enable/disable to his needs. This step requires a contract with SMASHDOCs. The containers required to run a SMASHDOCs environment are contained in a protected private registry. Please contact SMASHDOCs if you require authentication. Any changes to the compose file will be rerun on the specific parts of the configuration on consecutive executions. Docker compose will restart the changed service and dependant services. The domain names chosen above are required to be resolvable from hosts using the SMASHDOCs system. For different customers this step will be quite different. SMASHDOCs consultation can be acquired. This guide describes Kubernetes cluster provisioning using Azure managed kubernetes-as-a-service (AKS), and SMASHDOCs app install on Kubernetes (k8s) cluster. At the end of this guide you will have working instance of SMASHDOCs app in Azure cloud with public HTTPS access. Those steps are done once, before cluster creation. Sign in using az CLI utility. This step is required for further Azure resource provisioning from CLI. To sign in, use a web browser to open the page https://aka.ms/devicelogin and enter the code B4JGSFDGSV to authenticate. The providers need to be registered in following namespaces: Compute, Network, Storage to be able to create resources. You need to choose Azure location, in which SMASHDOCs app in AKS will be deployed. List short names for all locations, and pick short name for desired one. Pick desired resource group name and create it in Azure location, we will use k8s-cc-gr as group name and create resources group in Canada Central Azure location. Pick a name for k8s cluster, we will use k8s-cc-test Following command will create it with specified name, node count, and node flavor. It may take some time to finish provisioning. Look for JSON keys "provisioningState": "Succeeded" in output, it means cluster is ready to use. Status Ready is OK, now nodes can take workloads. Using AKS we can store cluster persistent data in Azure, but first we need to create Azure storage account. Look for group matching our cluster name with MC prefix, and create storage account with this MC-prefixed resource group, account name must be in lowercase, and don’t have ‘-’ or ’_’ in account name. We choose sdk8sccstorageaccount as storage account name. # create storage class "azure-file"
# create storage class "azure-disk"
Initialize kubernetes package manager helm server-side part, which is called tiller, empty output is OK, it means no releases have been installed by helm in k8s yet. Ingress deployment will create Azure LoadBalancer, pointing to newly created k8s cluster, we need to find out it’s public IP, and create DNS A record - azure.smashdocs.net in our case. Execute following command and look for EXTERNAL-IP address - it will be first, but later will be like 40.85.221.174 - this is Azure load balancer public IP address, this operation may take a few minutes to complete. SMASHDOCs app can be deployed using helm chart - the templates collecton, which describes k8s components like deployments, services, volumes, configmaps, ingress, etc. One of possible ways to organize resources (deployments, pods, volumes) in kubernetes by using namespaces. One of recommendations is to have one namespace per application. schedule: "6 5 * * *"
Now, we need to create kubernetes secret with docker login credentials, we use hub.docker.com, for private docker image registry, you can request your existing docker login to be linked, as our partner, for image pull. Now we are ready to install SMASHDOCs app into your k8s cluster. Following command will check configuration and deployment files syntax. It will output k8s deployment yaml files, but no objects will be created. $ helm install --dry-run --name azure --namespace azure -f azure-values.yaml . $ helm install --name azure --namespace azure -f  azure-values.yaml . First initialization for backend component may take some time, because Azure network attached storages with ReadWriteMany mode are slow. Congratulations, you have SMASHDOCs running in Azure cloud! $ helm upgrade -f azure-values.yaml RELEASE_NAME . Periodic backup of SMASHDOCs database and assets (docx, pictures, files, etc) is done by running special system component - backup container by Kubernetes CronJob. Backup schedule is defined in helm chart values file `backup:` section. This container reads database and minio credentials, cloud credentials from environment variables and kubernetes secret, creates archived dump of database, and archived copy of minio bucket, and uploads those archives to cloud-specific destination - AWS S3, Azure blob storage bucket, OpenStack elastic object storage. $ AZURE_STORAGE_CONNECTION_STRING="$(az storage account show-connection-string -n $STORAGE_ACCOUNT -g $RESOURCE_GROUP --query connectionString -o tsv)"
Include encoded Azure storage in Kubernetes secret, replace name with your namespace-backupsecret, values with base64-encoded Azure storage container name, connection string, and GPG key id, which will be used for encrypting backups before upload to Azure storage. Empty GPG_KEY_ID will disable backup encryption before upload to cloud, not recommended. # create secret in kubernetes namespace "azure"
schedule: "5 5 * * *"
$ helm upgrade --install --namespace azure -f smashdocs-values.yaml azure . It will fetch backup archives list from container (bucket), parse it, choose latest archive, based on date and file prefix, unpack them, restore database and assets. Normal   SuccessfulMountVolume  4m               kubelet, aks-nodepool1-24768417-1  MountVolume.SetUp succeeded for volume "default-token-d7zdh"
Normal   SuccessfulMountVolume  1m               kubelet, aks-nodepool1-24768417-1  MountVolume.SetUp succeeded for volume "pvc-edc6720e-68ea-11e8-92cf-0a58ac1f0520"
Normal   Pulling                1m               kubelet, aks-nodepool1-24768417-1  pulling image "mongo:3.6"
Normal   Pulled                 48s              kubelet, aks-nodepool1-24768417-1  Successfully pulled image "mongo:3.6"
Now you can connect with MongoHUB or Studio3T or mongodb cli to localhost:37017, and that connect will be forwarded to mongodb pod inside cluster. This guide describes Kubernetes cluster provisioning using KOPS and following SMASHDOCs app install on this cluster (k8s) cluster. At the end of this guide you will have working instance of SMASHDOCs app in AWS cloud with public HTTPS access. If your AWS account is not empty, and you don’t want to mix existing AWS resources with resources, which will be created by kops, create new sub-account in your organization. Login to your AWS account, go to Organizations menu, select add account, enter email, add new organizational unit, assign permissions for newly created account, it must have full access to organizational unit. Switch role from your root account to new one. Create kops user, add it to kops group, generate AWS_ACCESS_KEY_ID and AWS_SECRET_ACCESS_KEY and configure aws profile kops using those credentials. SMASHDOCs app requires persistent storage, so StorageClass must be provisioned in k8s cluster, kops is using gp2 (default) with kubernetes.io/aws-ebs provisioner by default. Ingress deployment will create AWS LoadBalancer, pointing to newly created k8s cluster, we need to find out it’s public IP, and create DNS A record - aws.smashdocs.net in our case. Execute following command and look for EXTERNAL-IP address - it will be first, but later will be like 52.58.70.14 - this is AWS load balancer public IP address, this operation may take a few minutes to complete. $ helm install --dry-run --name aws --namespace aws -f smashdocs-aws-values.yaml . $ helm install --name aws --namespace aws -f  smashdocs-aws-values.yaml . Congratulations, you have SMASHDOCs running in AWS cloud! $ helm upgrade -f smashdocs-aws-values.yaml RELEASE_NAME . Include encoded AWS credentials in Kubernetes secret, replace name with your namespace-backupsecret, values with base64-encoded AWS S3 bucket name, access key, secret key, and optionally GPG key id, which will be used for encrypting backups before upload to S3 bucket. Empty GPG_KEY_ID will disable backup encryption before upload to cloud. # create secret in kubernetes namespace "aws"
$ helm upgrade --install --namespace aws -f smashdocs-values.yaml aws .